Infos techniques Longueur du fuselage : 3,50 m; velocidad de aterrizaje 60 Km/h; velocidad máxima en tiempo recorrido 120 Km/h; relación de planeo monoplaza 27,5 a 67 Km/h; relación de planeo biplaza 28,5 a 75 Km/h; carga útil 200 Kg; carga alar biplaza 25 Kg/m²; este planeador cuya flecha de ala era de 22° 40 min al 25% de la cuerda y relación de ahusamiento: 1:5, fue diseñado para el entrenamiento en clubes de planeadores. Histoire résumée The I.Ae. 34 Clen Antu, sometimes known as the Horten XV after its designer, Reimar Horten was a two seat tailless glider built in Argentina. 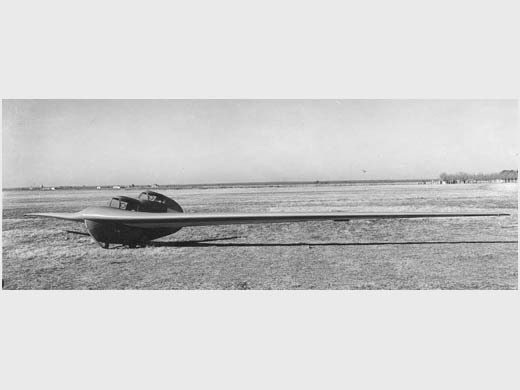 Two single seat variants competed unsuccessfully in the 1952 World Gliding Championships. Between 1946 and 1956 the Fabrica Militar de Aviones of Cordoba, Argentina was known as the Instituto Aerotecnico (I.Ae.). During that immediately post-World War II period, it had on its staff several designers who came from Europe, as Emile Dewoitine, Kurt Tank and Reimar Horten, the latter best known with his brother for their interest in tailless aircraft. His I.Ae.34 Clen Antu was recognisably one of the glider family that contained the Horten IV and Horton VI, though smaller than both. According to one source, the Clen Antu was intended as an aerodynamic model of a four engined flying wing transport, the I.Ae 38 Naranjero. Others state it was intended as a training glider for clubs. The Clen Antu was a pure tailless glider, a flying wing apart from a central accommodation pod. It had a high aspect ratio (about 17) wing, swept at 23.67o at quarter chord, with no vertical aerofoil surfaces. The chord decreased along the span to 20% of the root value at the tip, and the wing carried dihedral of about 3.5o. Broad chord tabbed control surfaces filled the trailing edge from the tip to about half span and air brakes were fitted. The accommodation pod was narrow but tall, providing fully instrumented tandem dual control positions. 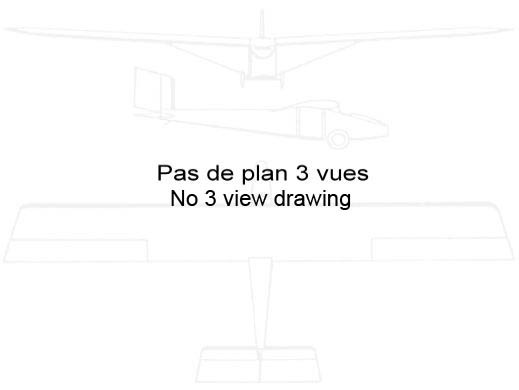 The forward pilot sat in a glazed cockpit on the wing near its leading edge, with the second seated in his own enclosed cockpit stepped above and behind the first. Aft of the cockpits the plywood pod ended in a flat oval shape which provided some yaw stability. The pod continued below the wing containing a tandem pair of wheels with brakes on the rearmost and skids below the nose. The first flight was made on 20 June 1949. Four of these two seaters were built, one used to explore unconventional control surfaces. Two more were built later for the Second International Glider Competition held in Madrid, Spain in 1952. Flight 27 June 1952 p.777 not 1954, as has been reported. Flight has the two aircraft as Horten XV; though in some early reports Flight refers to "two-seaters", images and references to "long undercarriage" identify the I.Ae.34 M single seater These were single seaters designated I.Ae.34 M (for Monoplace), though at the competition they were recorded as Horten XV. Flight 18 July 1952 p.75 Horten XV launch The accommodation pod was smaller, though still relatively tall and narrow; the pilot sat near mid wing under a removable section that was part wooden fairing, part glazing. Underneath the wing the pod, which now contained a single wheel, only reached forward to midwing. The undercarriage was completed by a nosewheel that retracted into the leading edge of the wing. The single seater was 25 kg (55 lb) lighter than the I.Ae34. The I.Ae.34 Ms did not distinguish themselves in the competition, which was rather dominated by the Slingsby Skys, failing to finish in the top twelve. Flight 25 July 1952 p.87 S.I.G.C. 1952 final results table Both suffered landing damage in practice, attributed to their "long undercarriage". Flight 11 July 1952 p.31 One was withdrawn before the start of the competition proper, Flight 11 July 1952 p.32 and the second was damaged and withdrawn on day 4. Some sources use the Horten notation, in which the I.Ae. 34 is the Horton XVa, the I.Ae. 34 M is the Horton XVb and the I.Ae. 41 the Horten XVc. Primer planeador tipo ala volante desarrollado y construido en Sudamérica sin cola. El vuelo de prueba lo realiza el 20 de junio #46 de 1949 en la pista del Instituto Aerotécnico, y fue presenciado por el Señor Ministro de Aeronáutica Brigadier César Ojeda, Comandante en Jefe de la Fuerza Aérea Argentina Brigadier General Oscar Muratorio, Gobernador de la Provincia de Córdoba Brigadier Juan Ignacio San Martín, Comandante de la Cuarta División de Ejército General Ambrosio Vago y otras personalidades. 4 aviones fueron construidos, uno de los cuales era un I.A. 34 modificado para experimentación con superficies de control no convencionales. Biplaza en tándem con asiento del copiloto en plano más elevado, doble comando, freno aerodinámico, cabina cerrada (cúpula de acrílico), equipo de oxígeno para ambos puestos (reserva, para tres horas), en la proa un patín de madera compensada para aterrizaje y en la parte posterior dos ruedas fijas con freno mecánico, doble comando, instrumental completo para vuelo a ciegas en ambos puestos. A fines de 1947 llega a la Argentina el Dr. Reimar Horten, uno de los mas reconocidos estudiosos y constructores de ala volante a nivel mundial (cuya historia escapa a los alcances de esta nota). En 1948, con la autorización del Brig. San Martín, Horten comienza a desarrollar un planeador biplaza para instrucción denominado por el instituto aerotécnico IA-34 Clen Antú (rayo de sol), H.XV pora Dr. Horten, su primer vuelo lo hizo el 20 de junio de 1949. Se construyeron tres de estas maquinas. par HALBRITTER, Francisco (2004) [p. 342, 357, 359, 360. Texte + 6 photos + plan 3 vues].